This lock of Robespierre's hair, which once belonged to his sister Charlotte,was acquired by the Carnavalet in 1887. 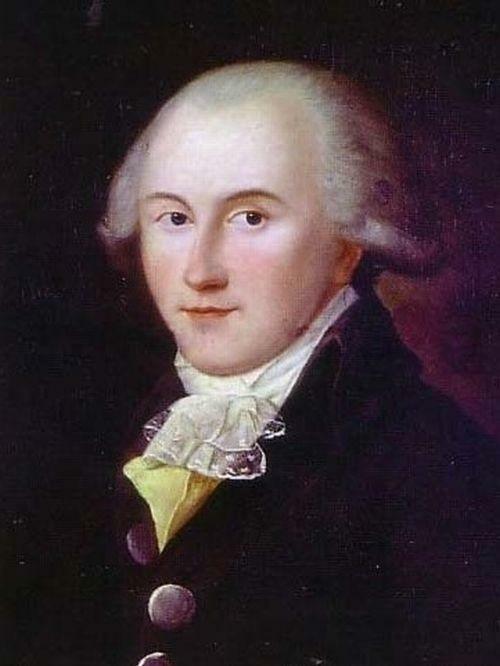 It was formerly displayed alongside the portrait attributed to Boilly, now often identified as Augustin Robespierre. In the photograph at least, it appears almost white. This seems a little odd, as Robespierre's hair was almost invariably described as light brown - the result of hair powder? bleaching over time? - who knows. 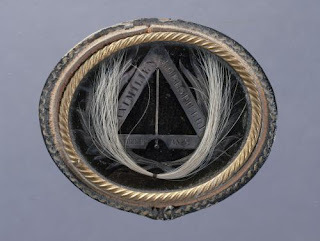 A lock of Robespierre's hair has just come into the hands of the keepers of the Musee Carnavalet here, and will in future be exhibited in that place by the side of the portrait of the Terrorist painted in 1783 by Boilly. Robespierre in that picture is represented as a young man with finely-chiseled features, blue eyes, carnation lips, and light chestnut hair, and looking totally unlike the "sea-green and aceto-virulent" person suggested by Carlyle's pen-portrait. The lock of hair is of the same colour as that in Boilly's picture. It was inclused in a locket or medallion, on which were engraved the word "egalite", the date of the "9th Termidor" and the martyr's palms. The souvenir belonged to Robespierre's sister Charlotte, who, on the death of the Terrorist, was sheltered by one of his adherents, the Citizen Mathon. Charlotte Robespierre in May 1834 died in a garret in the Rue de la Fontaine, and left the relic to Mathon's daughter, from whom it passed into the possession of a '48 man named Gabiot, whose son has handed it over to the Carnavalet. Thanks for the clarification - what a shame it has lost its colour.